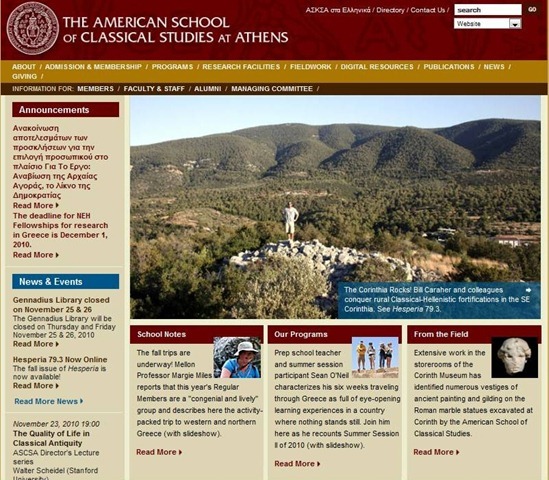 “The Corinthia Rocks!” The homepage of the American School of Classical Studies at Athens website gave some attention this week to Lychnari Tower in the southeast Corinth, one of the Classical-Hellenistic sites Bill Caraher and I investigated in 2008. One of the scrolling images on the site shows Bill Caraher standing on Lychnari Tower (photo by K. Pettegrew). Yes, it doesn’t look like much but a pile of rocks now, but believe it or not, that was once a tower that stood as high as 15 m (50 feet) above the ground. The full article is available here* as a PDF offprint, and is posted in the EKAS Publications section of this website. If you don’t have time to read the text, there are some nice images of the rural Corinthia in the piece.